Identify and describe positions in government. Why does Texas have more representatives than Louisiana? It is a larger state and takes up more space. It has a larger population. It is closer to Washington, DC. John Boehner is the leader of the House of Representatives because he is the leading Republican and the Republicans have a majority in the House. What is his official title? Could YOU be a Representative for Louisiana? No, I don't live in the right place. No, I'm not old enough. No, I don't have a college degree. Yes! I meet all the qualifications! Louisiana has the same number of Senators as Texas. The leader of the Senate is called the President of the Senate and the leader of the House is called the President of the House. The leader of the Senate is called the President of the Senate and the leader of the House is called the Speaker of the House. The leader of the Senate is called the Speaker of the Senate and the leader of the House is called the Speaker of the House. The leader of the Senate is called the Speaker of the Senate and the leader of the House is called the President of the House. For which are the qualifications MORE STRICT? House of Representatives, you have to be older and a citizen for longer to be a Representative. Senate, you have to be older and a citizen for longer to be a Senator. Senate, you have to have more education. Representative, you have to have more education. Which of the following is NOT a qualification for being the President? Being at least 35 years old. Being a born in the United States. Living in the USA for at least 14 years. How does the vice president become president? If the president gets impeached. What are the qualifications to be Vice President? What branch are the cabinet members a part of? Who gets to choose who the cabinet members are? The President: they work for him, so he chooses them. Wait, what is Judicial Review again? The Supreme Court can kick the president out if he breaks the law. The Supreme Court can decide if laws and actions are unconstitutional. The Supreme Court can appoint new Justices. They Supreme Court can override a Veto. Why couldn't Obama pick his best friend to be on the Supreme Court? Because his best friend isn't old enough. Because Congress would use legislative review to check the president and stop his appointment. Because his best friend didn't go to law school. Which of the following does NOT match up the counterpart at the state and federal level correctly? What is similar about the legislative branch at the state and federal level? They both can impeach the president. Their main job is to make laws. They have the same number of members. They are elected for the same amount of time. the separation between the three branches of government. the idea that each branch should be able to control the others so no one can get too powerful. How many government do you have? 0 - I am my own government. 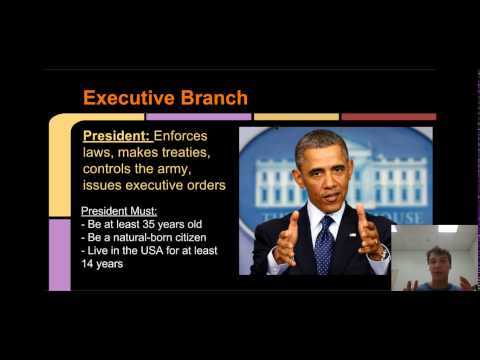 What does separation of powers mean? There are three branches of government, executive, legislative, and judicial. There are three levels of government, federal, state, and local. There are three levels of government: federal, state, and local. Power is divided into three branches: executive, legislative, and judicial. Besides separation of powers, what else does this diagram show?